Everyone experiences stiff muscles from time to time, whether after a rigorous workout, in cold weather, or after falling asleep in an unusual position. People with cerebral palsy, stroke and multiple sclerosis, however, live with stiff muscles every single day, making everyday tasks such as extending an arm extremely difficult and painful for them. And since there isn't a foolproof way to objectively rate muscle stiffness, these patients often receive doses of medication that are too low or too high. 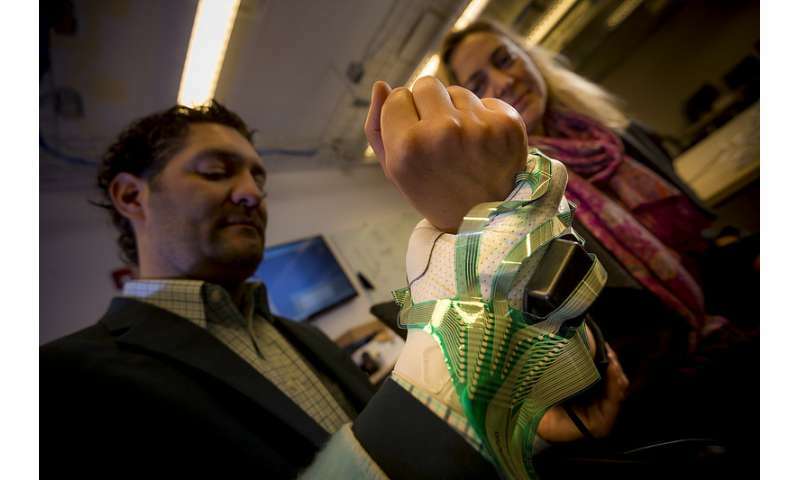 Now, an interdisciplinary team of researchers at the University of California San Diego and Rady Children's Hospital has developed new wearable sensors and robotics technology that could be used to accurately measure muscle stiffness during physical exams. "Our goal is to create a system that could augment existing medical procedures by providing a consistent, objective rating," said Harinath Garudadri, a research scientist at the university's Qualcomm Institute and the project's lead investigator. "Many clinical exams and procedures are very subjective and rely on measurements that are done with a physician's hands," said Andrew Skalsky, director of the division of Rehabilitation Medicine at Rady Children's Hospital. "We often make major medical decisions and diagnoses based on touch and feel. With this technology, we can start to develop objective measurements for subjective processes." Patient feedback can also skew these ratings, Skalsky said. "Sometimes, patients think that they aren't getting enough medicine and end up being put on a higher dose than they should actually be on. That's thousands of dollars' worth of medicine that could potentially be saved." The device is built on a regular sports glove that a doctor can wear while holding and moving a patient's limb back and forth. Taped onto the palm are more than 300 pressure sensors that measure the amount of force required to move a patient's limb. A motion sensor taped on the back measures how fast the limb is being moved. The glove is connected to a computer via USB. Data from all the sensors are transmitted to the computer, where they are integrated, processed and mapped in real time using advanced signal processing algorithms developed by Garudadri's research group. The computer provides a numerical reading that calculates the actual power required to move a patient's limb—the more power needed, the more severe the patient's spasticity. "We're instrumenting the doctor instead of the patients," said Padmaja Jonnalagedda, an electrical engineering graduate student who worked on refining the algorithms. "It's more convenient for patients to not have to wear all these sensors all over their bodies. It's also more practical to equip just the doctor when you think about the large patient to doctor ratio, especially in developing nations or rural areas around the world," she said. Researchers built another robotic device that they call the "mock patient" to serve as a control to validate their results. The mock patient consists of an artificial arm that can be moved up and down, simulating the flexing motion of an actual patient's arm. The artificial arm is connected to a rotating disc that can be manually adjusted to different resistance levels, like bike gears. The arm is embedded with its own set of sensors that measure the power needed to overcome the resistance and get it moving. Researchers can set the resistance, know the amount of power required to move the arm and then test whether the glove produces a matching result. "The mock patient provides a ground truth to verify that what the glove is measuring is indeed a real number," said Fei Deng, an electrical engineering graduate student who was in charge of building the mock patient. In an initial study, two physicians trained in spasticity assessment were instructed to test the glove on five different patients with cerebral palsy. Each physician wore the glove while performing various movement tasks, including flexing and extending the patients' arms and legs. The physicians were asked to provide their own spasticity ratings according to the Modified Ashworth Scale, without knowing the readings from the glove. They also did not know what spasticity ratings the other was giving. The research team compared the results. They found that only 27 percent of the physicians' spasticity ratings agreed with each other. By comparison, 64 percent of the measurements made by the glove agreed with the numbers generated by the mock patient. "This number needs to be higher if we want to deploy our system for use in the hospital, but it shows better consistency than existing spasticity assessments," Garudadri said. "The multidisciplinary nature of our team is what makes this project so exciting and successful. Experts in signal processing, robotics, printable electronics, neurosciences and medicine came together to transform a subjective process into something that's objective and could improve patient care and outcomes," said Leanne Chukoskie, research scientist at the Institute for Neural Computation at UC San Diego. Researchers are also continuing to improve the system. 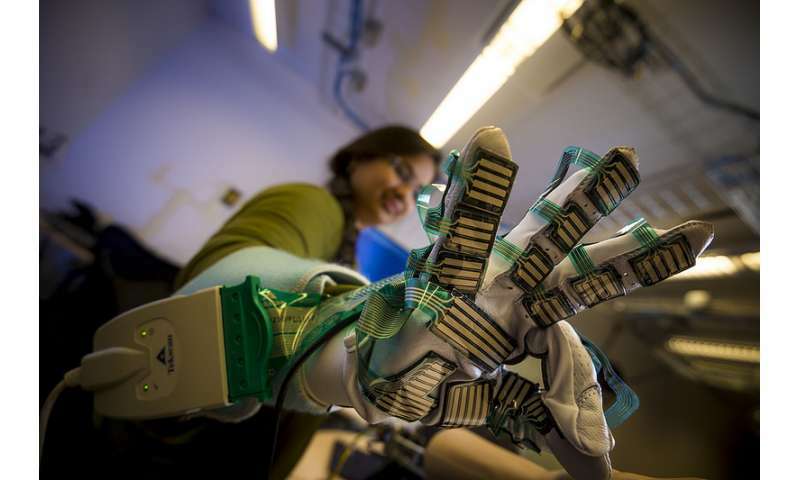 Tina Ng, one of the electrical engineering professors on the project, is developing sensors that are more robust and can be directly printed onto the glove, rather than taped onto the surface like they are now. "This will make it easier to create different sizes of gloves," Ng said. Michael Yip, an electrical engineering professor and a core member of the Contextual Robotics Institute at UC San Diego, is integrating haptics, or force feedback, into the new mock patient. "Now, being able to actively push back on the doctor's arms and replaying real profiles of patients' spasticity on the simulator will allow doctors to improve their ability to assess and treat patients, and provide data to improve objective metrics from the glove," Yip said.